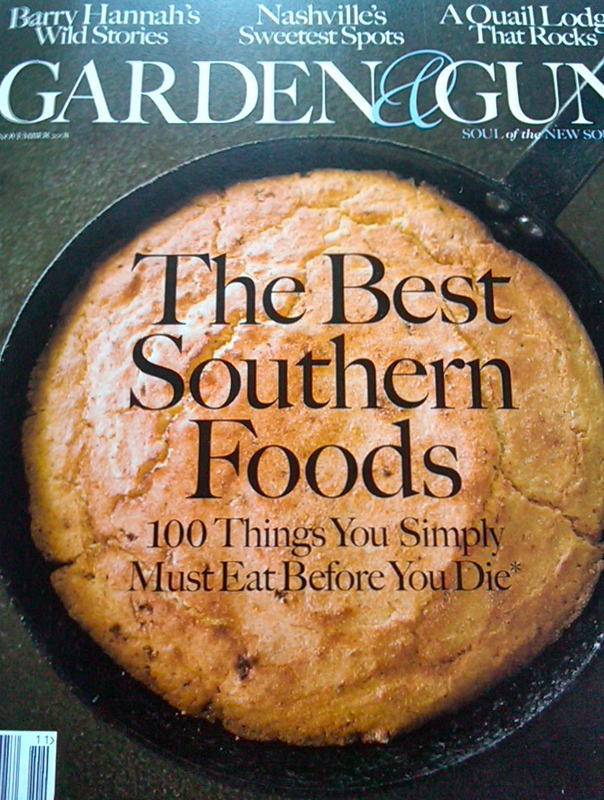 I first saw this magazine around November 2008 while new-publication-spotting at a local bookstore. I bought that month’s edition for two reasons: 1) the name and 2) to see if what was inside lived up to the name. It did. Even the weight of the paper and cover cardstock had a good hand to it. (I just love it when I get what is promised.) I am happy that this publication is still with us…despite the economic sludge oozing about and this dawn-to-dusk, insufferable heat. This name has symmetry. The initial hard “Gs” are guts-and-glory strong. It’s a fast, sharp, on-the-money name that promises focus and range. And it delivers. I’ve lived all over the US and beyond. Most people I’ve met along the way do not know the South, even if they think they do. Worse still are those who’ll never admit (particularly to a Southerner’s face) that they have no interest in getting to know it. Since I am a fan (or as I like to call it, an appreciator) and have seen a lot of it, I can vouch for its ups and downs. In fact, I’ve often found myself an unofficial ambassador for the region — the Secretary of De Fence — helping people climb over from ignorance to enlightenment. Now, I don’t force anybody to see things like they ought to, but I do enjoy sharing with them what I’ve experienced in this large sweep of land from Texas to Kentucky, Virginia, due south and then over to the other LA (Lower Alabama). Don’t forget, folks: Florida is not the South, unless you’re talking old Florida, the backroads kind (what remains). Atlanta is not the South, either. Georgia, yes. There is a difference. Hey, and if the South weren’t so nice, why is it that it has been diluted by Northerners and Otherners moving here in droves and causing such a traffic ruckus? Now, Garden & Gun needs a little help with that last sentence up there in paragraph one, and they cut themselves a tad short above by not talking about other topics they cover, such as sports and architecture (although the latter are mentioned on their site in their own blurb). No quarrels. All is well in Dixie. The South sneaks up on you. Come see what I mean.